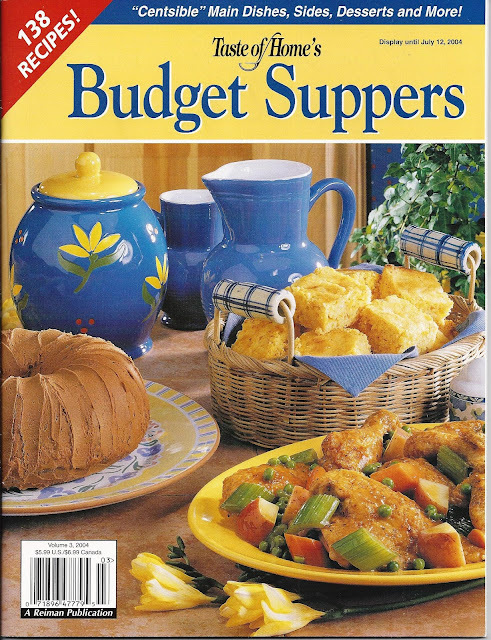 Taste of Home’s Budget Suppers is a cookbook magazine published in 2004. It is really usable now when groceries are so high and going higher. Who among us can’t use a recipe for an inexpensive meal to feed our families and friends. This has the recipes arranged in a meal type of setting. Your main entree, sides and dessert. You can of course pick and choose but it is helpful to get some ideas for a whole meal and what goes together. One of the favorites I made from this was a small size chocolate cake. Excellent cake, not rich and not frosted. Just the thing to fill a chocolate craving without busting the calorie diet. Both of us found a variety of recipes to try and hope you will too. Many times these older magazines will turn up at a book sale, yard sale or as our library does, they are put out to be sold for a dime. Be sure to look at them the next time you see cookbook magazines on sale. I bought this on newsstand in 2004 and consider it one of my favorite cookbooks! I called the publishers in 2006 asking if they would publish regularly. Never saw another. Worth your readers searching this one out! Thanks again for sharing your favorites. We seem to like the same books. Hi Lori, Glad we seem to like the same books as maybe there is a recipe we tried that you didn't and might want to. Yes I am still enjoying the I.P. but I don't use it as much as some of the bloggers out there seem to do, just when I might use a pressure cooker anyway. A lot of the time it is easier and just as fast to use the stove top but I find my favorite thing to use it for is stocks and broths.